Avais was born with Cerebral Palsy. When he was younger Avais could walk with the use of a walking frame, but at the age of 9 he lost his ability to walk with his walking frame and became dependant on a wheelchair. When Avais came to MOTIONrehab at the beginning of October 2018, he was unable to take more than a few steps with his walking frame. Avais’s family bought him to an assessment for MOTIONrehab’s Intensive Neurological Rehabilitation Programme. At the time, it was felt that Avais was too weak to complete the intensive rehabilitation programme (80 hours over 4 weeks) and it was decided that the team would start to work with Avais slowly, focusing on building up his strength. 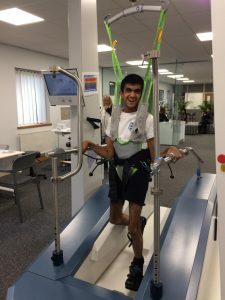 Initially Avais came to MOTIONrehab’s Intensive Neurological Rehabilitation Centre for two sessions a week and he has quickly developed his strength enough to increase to three sessions a week. Avais has spent time working on improving his balance and control along with building up his strength using LYRA, PABLO and BALO. Avais has enjoyed using the devices and the games helped to keep his therapy sessions motivating and enjoyable. Just four weeks later Avais is now able to walk for six minutes with his walker at home. This week it is a double celebration because it is his 16th birthday and has also won a football award for his increased control on the pitch!